When talking about file formats, MPEG4 and MP4 are two of the most commonly confused words which are often mistaken to be the same. But technically MPEG4 and MP4 are two different terms with a different meaning, use, and application. Read below to know in detail about the difference between MPEG4 and MP4. Introduced by Moving Picture Experts Group in late 1998, MPEG4 is basically an algorithm that defines the compression of the audio and visual data (AV). The method is mainly used to include compression of AV data for purpose of the web and streaming media, voice and broadcast TV application, and CD distribution. MPEG4 is an evolving standard at present as well and it is divided into a number of parts with major parts including MPEG-4 part 2, MPEG-4 part 10, MPEG-4 part 14 and others. The majority of the features included in MPEG4 are left at the discretion of the individual developers to decide if they are to be implemented or not. Thus it can be concluded that there is no implementation of the entire MPEG4 set of standards. MP4, which is technically MPEG4 Part 14, is basically a digital multimedia container format that is used for storing videos, audio, still images, as well as subtitles. With .mp4 as the filename extension, the format allows streaming over the internet and it is the standard specified as a part of MPEG4. MP4 is one of the most commonly used file formats that is compatible working with the majority of portable devices and media players. Listed below are some major differences between MPEG4 and MP4. MPEG4: This method was generated in late 1998 as a standard of AV coding formats. The method refers to all the well-known method of compression of the MPEG group. MPEG4 is applied for compressing AV data for the web and CD distribution, broadcast TV, and voice including telephone and videophone. MP4: MPEG Part 14 ( MP4) resulted from MPEG4 part 12 that was developed from Apple MOV file ( QuickTime File Format). Thus it can be concluded that MP4 is based on MOV file type from Apple. In addition to MP4, MPEG4 includes other media container formats for video encoding like AVI, MXF, QuickTime, Matroska, and Ogg. Considering the definition, history, and application it can be concluded that MPEG4 is an encoding algorithm that defines how the images are compressed and then converted to data. MP4, on the other hand, is a container format that specifies the design of storing data that is encoded by MPEG4/H.264 and other related data like images, audio, subtitles, and chapters. So MPEG4 is not same as MP4, rather latter is the format that is a part of the former method. It can be concluded from above that MPEG4 can be used to generate different types of formats like AVI, MPEG4+ PCM, and others using other codecs like H.264, PCM, and AAC. So if your device or player is not compatible with the different MPEG4 format, you need to convert MPEG4 to MP4 format. The majority of media players are supportive to MPEG4 format but there are few players like RealPlayer and others that has compatibility with partial MPEG4. Few MPEG4 formats like .mts do not play on iPhone, and in such conditions converting MPEG4 to more popular MP4 format is an ideal solution. Many times MP4 file is needed for editing and other customization needs and if your present file is in MPEG4 format, then you would need to convert MPEG4 to MP4. The software is powered by APEXTRANS technology that makes the conversion process 30 times faster compared to other software. Batch processing support of the software enable to convert multiple files at a time. Allows downloading and recording videos from more than 10,000 popular sites which can be then converted to the desired format as well. Software support conversion to various preset device compatible formats. In addition to MPEG4 to MP4, software supports conversion between 1000 other popular formats. 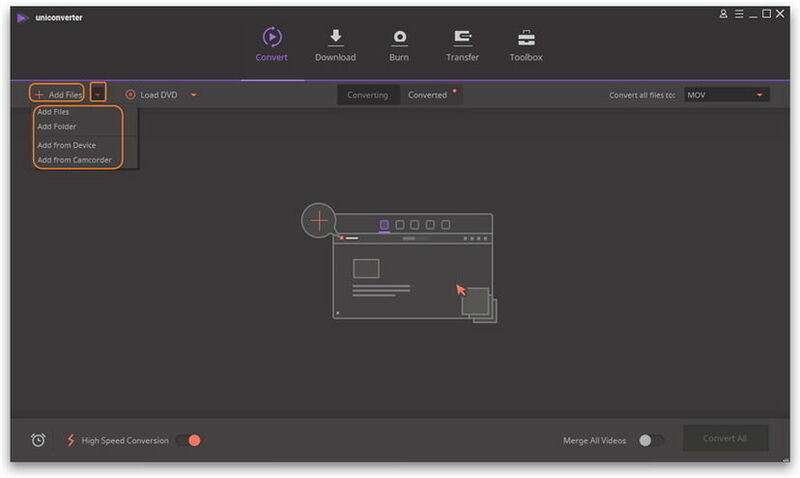 Allows editing videos with an array of features like cropping, trimming, merging, rotating and others. Works as a DVD toolkit with features like converting DVD, backup DVD, editing DVD, and burning and creating DVD. Allows streaming media files present on your PC to your smart or standard TV. Step 1 Launch Wondershare UniConverter (originally Wondershare Video Converter Ultimate) and load MPEG4 file. Download, install and launch UniConverter (originally Wondershare Video Converter Ultimate) on your PC. On the main software interface, click Add files and browse for desired MPEG4 file on PC. The selected MPEG file will be added to the software interface. Step 2 Select MP4 format as the output format and covert MPEG4 file to MP4. On the right side panel, click the inverted triangle beside Convert all files to:, select Video > MP4 and the resolution. Finally, click Convert to start the conversion process. The selected MPEG4 file will be successfully converted to MP4 format. So whenever you are looking for a solution on how to Convert MPEG4 to MP4, opt for UniConverter (originally Wondershare Video Converter Ultimate) to enjoy quick, easy and quality lossless video conversion. > Resource > MP4 > MPEG4 VS MP4, How to Convert MPEG4 to MP4 Easily?